Now in its 55th year, the PCI Design Awards program recognizes 21 projects across parking structure, building and transportation categories. This year saw 100-plus entries from producers, engineers, and architects across North America. "Our awards program is meant to challenge our industry to continue to push the envelope and to innovate in the design and production of precast concrete systems," says PCI President Bob Risser. 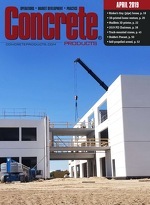 "The variety and quality of [entries] producers and their partners in the engineering and architectural communities submitted for consideration this year demonstrate how versatile precast concrete systems are for creating sustainable, cost-effective projects." Building and transportation project entries are judged on aesthetic, structural, and use versatility; site, energy and operational efficiency, and risk reduction; and, resiliency, such as structure durability, multi-hazard protection, plus life safety and health. PCI weighs additional criteria for recipients of the special Harry H. Edwards Industry Advancement, All-Precast Concrete Solution, and Sustainable Design Awards.